A well presented, recently decorated throughout, extended three bedroom semi detached home, within walking distance of Buckingham town and all the amenities. The property benefits from a re-fitted kitchen breakfast room and a re-fitted bathroom. Accommodation comprises: Entrance porch, entrance hall, lounge/diner with wood burning stove, kitchen/breakfast room with French doors leading onto the patio, ground floor cloakroom with space and plumbing for washing machine. On the first floor, landing, three bedrooms and re-fitted family bathroom. Off road parking to the front and fully enclosed and private gardens to the rear with brick built store with light and power. EPC rating awaited. Viewing recommended. Stairs rising to first floor, radiator, under stair storage cupboard, wood laminate flooring, radiator. Having a feature fireplace with exposed brick work and wood burning stove, four wall light points, ceramic tiled flooring, Upvc double glazed window to front aspect. Re-fitted to comprise inset Belfast sink unit with mixer tap, cupboard under, a further range of wall, eye level and base units, work tops over, ceramic tiling to splash areas, integrated dishwasher, space for American style fridge/freezer, space for a range cooker. Cupboard housing 'Worcester' gas fired boiler (replaced approx 2 years ago) serving both domestic hot water and radiator central heating, inset down lighters, ceramic tiled floor, Upvc double glazed window to rear aspect and Upvc double glazed French doors to patio and rear garden. 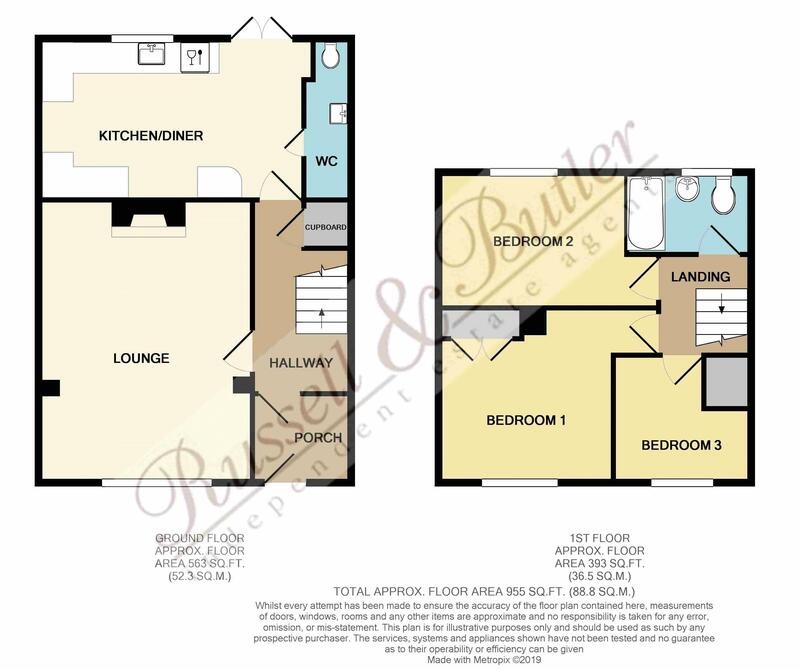 White suite of low level W/C, wall mounted wash hand basin, extractor fan, inset down lighters, space and plumbing for washing machine and tumble dryer. Ceramic tiled flooring. Inset down lighters, loft access, part boarded with ladder and light. Having the benefit of built in cupboard and shelving, radiator, Upvc double glazed window to front aspect. Including stair bulk head. Radiator, Upvc double glazed window to front aspect. Re-fitted white suite of panel bath with separate shower over, low level W/C, pedestal wash hand basin, radiator, inset down lighters, full height ceramic tiling to walls, shaver point, extractor fan, Upvc double glazed window to rear aspect. Part enclosed driveway leading to property entrance, gated side access to rear garden. A fully enclosed sunny and private rear garden with paved patio entertaining area, steps with LED lighting leading to raised lawn area with safety glass and wooden post railings, established flower and shrub beds, timber garden tool store, timber log store. Outside lighting. Outside tap. A really useful store or workshop with light and power connected.